Festive holidays are upon us, Second Life is experiencing widespread snowfall, and Residents are decorating and celebrating. While our individual cultural traditions are diverse, Residents have created their own, homegrown fun, throughout our shared virtual world. It’s a cheerful sight to see so much gleaming snow, with delicate snowflakes falling…. Here’s a recap and look at what’s ahead! Snowman Building Contest, Dec 23rd, 11 AM-1 PM at Rainier on the Teen Grid! Look for your favorite Linden targets at the annual Residents vs. Lindens Snowball Fight in the following regions: Egan, Hatton, Moritz, and Prancer. December 23rd Noon til 10pm and December 24th, Noon til 7pm. 24-Hour Music Festival, Dec 27th! That’s right, there’s fun around the clock @ I-World Island on December 27, midnight to midnight PST. A talented lineup of Resident musicians & DJs will be present to perform with the holiday spirit. Mark your calendar so you can come join us center stage and pack the house! Upload your winter joys from Second Life — and don’t forget the SLurls! – to our special Winterfaire Flickr group. You’ll need a free Flickr account (1,000s of Resis have already joined Flickr), and after we’ve assured your photos are indeed of family-friendly thematic awesomeness, they’ll be visible to all. For some tips on inworld photography, see my guide. Our Holiday Marketplace has opened up for you to visit, in Dasher, Prancer, Donner and Blitzen, carrying with it not just good cheer but the spirit of consumerism! Stock up on skis, trees, skates, and other gear to get you going. Keep checking the Winterfaire Flickr group, for there’ll be SLURLs, easy-to-share links to SL locations you can get to in a couple clicks. Spread the word — bring your friends and share the eggnog and the laughter as you explore and participate in Winterfaire in Second Life! Come join us for Winterfaire… only in Second Life! This entry was posted in Announcements & News, Community, Creativity & Ideas, Events, Inworld Content, Resident Experience. Bookmark the permalink. 37 Responses to Friendly Season’s Greetings! 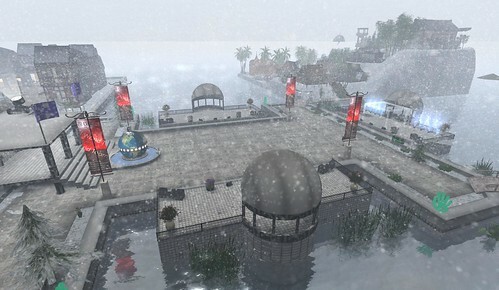 Enjoy Winterfaire in Second Life! Is there a snowman building contest on the main grid too? Can we form some sort of info group passing out which Lindens are at which snowball venue? You know cos it make some peoples years to hunt down one or to in specific, Linden snow watch 08 “reports are in that Jack has landed in Moritz, come quick!” etc. Anywho, happy holidays all, here’s hoping theres an hour or two left for work before break /me points at ticket queue. Frrrriendly greetings and thanx for da comments! HO HO HAPPY HOLIDAYS TO EACH OF YOU. You know how much I love to reply. And if you don’t, now you do (ha ha!). You can also see where I’ve been in Second Life lately! LOTS of seasonal goodness, apparently. I don’t know of any other Linden-hosted events than the ones listed above, and while next year can be a long time, we definitely should keep these suggestions in mind. @Caerus: Cuddly bears are by Sway Dench. They’re AFAIK new. @Ewan: You sure can. For the record I’ll be there with fellow Lindens today (Dec. 23rd) @ 1 PM Pacific. And spontaneously at other times, if only to take pictures and laugh. Like crazy. Merry Christmas and Happy Holidays to all. May peace and joy and love surround you the whole year through. MERRY CHRISTMAS TORLEY!!! And the very warmest wishes of Love and Peace to all!!! I know of a group of tiny carolers that would love to sing for you Torley! 😉 Take care and thanks for all you do!!! Merry Christmas, I’m really excited about the Winterfaire events in SL. Nice post!!!!!! I’ll be at a Snowball Fight at 3pm on the 24th….And I’ll Tweet or Plurk which one I’m at and which Lindens are there, how’s that? I hope you are all having a truly wonderful time enjoying the holidays. @Katt: Sounds awesome to me! You can follow Katt @ http://twitter.com/katt_linden or http://www.plurk.com/Katt_Linden and if you don’t already use Twitter or Plurk, they’re free, fast ways to share what’s going on. @Ginger: Will definitely keep that close to heart. We’re hoping to do more varied login screens deep into the New Year too… ! They sure spice things up. @Daniel: I’ve been watching http://www.flickr.com/photos/danielvoyager/ with much interest. Great Winterfaire contributions! The landing points need to be posted here on the blog rather than simply referencing Region Dead Center. You have residents landing in people’s shops. There are no signs nearby telling you where the Lindens can be found, no snowballs are available for residents to grab and use and because the area around the landing point is owned by residents rather than Governor Linden many residents have opted to turned push and scripting off so even if you have a snowball that you want to throw, you can’t. @Daniel How’s the MG working out for you? Hey, Torley!!! Great to hear from you on the blog. Thanks for the lovely wintery wonderland vidtut, too. Happy Holidays! The winter events sound fantastic, especially the snowball fight today. I hope your okay Torley after the approximate hundreds of snowballs I threw at you. Hooray for winter! The snowball fights were awesome, but I WILL get revenge at tomorrow’s epic battle! I will try to come at snowfight. That will be funny and indeed nice to see again a post from Torley. You shoot me Torley >.< ! @Ryou: Nice to be here with you! @Real Love: Yes, and what an awesome Second Life name you have. In case you didn’t already see it, I posted a video from yesterday’s Snowball Fight at the top of this blog post. Aww… too bad I missed it! Wish I was there. thanks Torley for the updates! Certainly i will pass by when i have the time. Torley, yes it is great to see you on this blog. All for your wonderful fabulous work that has enlighten us. and thank you to all the Lindens that joined in and were good targets erm I mean sports.. I hope to adept a new wish for 2009, and that is to use less Typonese languages… it’s only my wish lol. But i guess it’s a little extra that comes with sl hahah. Yes, I think this year the Residents Vs. Lindens snowball fight will be a really great hit ;).